Overall, Idaho, was a strange and weird book for me. Granted, there were many parts that were quite beautiful – the writing left me in awe. There were many sad and tender moments as well, but mainly it was very odd and strange. The author did not give up a great deal, leaving much for the reader to piece together and work through the events and actions of the people, which is perfectly fine, but it did leave my brow furrowed in confusion for most of this book. While the book has alternating points of view, most of the book is voiced by Ann. Ann has married Wade after the death of his one daughter, the disappearance of the other and the imprisonment of his wife, Jenny. Wade suffers from inherited early onset dementia, so the memories shared with Ann about May’s death and June’s disappearance are foggy. Certainly, very foggy for the reader. Ann spends time trying to piece together what happened on that tragic day, often in secret, and is torn as to prompting Wade, provoking anger or sadness, or continuing to live in this state of almost denial and confusion. At no time is the reader given an explanation, or understanding as to why Jenny killed her daughter, and the events surrounding the subsequent disappearance of June. There aren’t many details leading up to this fateful moment and indeed much of the story takes place in the years following the tragedy. The storyline about the disappearance of June was weird for me. I don’t think it was well developed, or done in a way that added anything special for me. If that makes any sense? June’s disappearance is an odd and unsettling thing – Ann seems to be the one to keep up some kind of search, but this whole aspect of the story seems unfinished and kind of hangs out there in the wind. The reader is given fragmented pieces of June and May’s childhood, a looking back in a way, and if these were provided so as to understand why May was killed and June disappeared, they were thin threads so tenuous, they almost seemed irrelevant to the story. The parts I really enjoyed and wished there were far more of them in the book, were with Elizabeth and Jenny in jail. Elizabeth was a great character and it’s too bad there wasn’t more time spent with her. I really did wish there was more to this part. I really enjoyed this aspect of female friendship and the slow development of their meaningful friendship in jail. Here again however, we aren’t really given much in the way of getting into Jenny’s past mindset, or given any real understanding for her actions on the day she killed her daughter. The many inconsistent threads in Idaho, that are also steeped in this thick fog left me with more of a frustrated feeling overall. 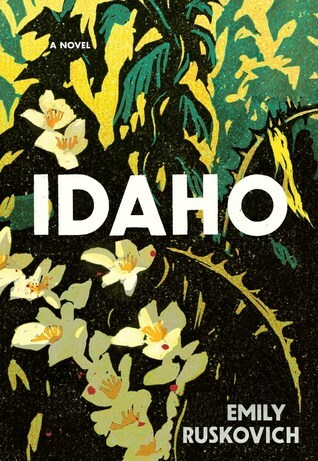 Idaho was a reading experience much like Swimming Lessons was for me – I liked it, but the parts that left me with a sense of awe and wonder were fewer than those that bothered and frustrated me. If you’re looking to Idaho for a strong plot-driven novel, it is not that at all. Rather it’s far more quiet and dream-like read, one that drifts aimlessly along, leaving the reader with perhaps more questions than answers at its end. I thought Mom killed her because she was singing the song Ann taught Wade. And then, when I learned about the age differencebetween Jenny and Elizabeth, I wondered if Elizabeth was June. Interesting thought but my practical self says that there would be recognition that would be difficult for either to ignore or pretend away. Although the mind is a mysterious thing….